January’s coming to a close leaving us with two more skin covered months to endure, with the winter blues just setting in by now. However, with each passing month we move closer to seeing some signs of life. Finding myself with nothing to wear during these blah months, black is always my go-to choice when I want to be head-to-toe in a chic ensemble. When the climate is questionable, I find it easy to get bored with my current state of closet. Let’s face it. This has been a strange, mild winter and the peculiar 2011-2012 season continues this week. But, black, you are always my friend. Here is Alexander Wang’s T line for Fall 2012. T for Totally cool. I’ve been donning these looks lately, mainly for their sense of ease. Black and white, white and black. Easy breezy. T by Alexander Wang Pre-Fall 2012, . With Pre-fall on the brain, I can’t help but admire (and envy) the black-clad chic Parisien women dashing from show to show with their Chanel totes in hand. Here’s a peplum top rearing its gorgeous head at Celine. I love it worn with a pantsuit. Spartan yet divine. Menswear fabrics and strict tailoring were Wang’s strong points for Fall. Less street this season, more seriously chic. Check out all the different possibilities of how to be monochrome. All the fabric playing against each other just works. Finally ..here is a reprisal of the jumpsuit from Spring 2011 but this time in leather. The collection was a reinterpretation of YSL’s past now modernized, destined to be a classics of today. 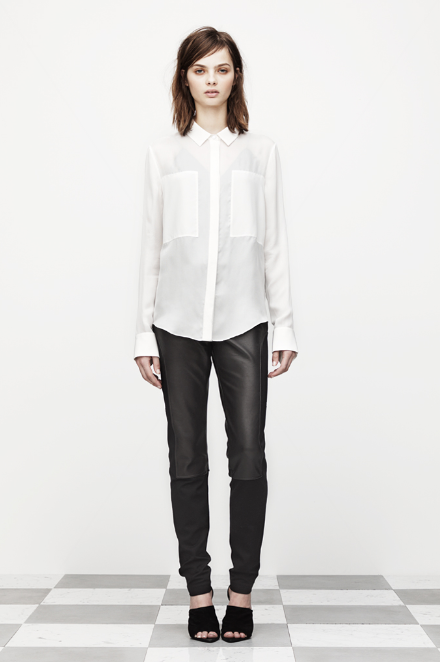 Whether leather or chiffon, it’s a fusion of feminine- looking function clothing. It’s nice to see the non-committal way fashion is heading. I am definitely embracing this uniform way of dressing.